If there’s one thing that people often overlook when using a chainsaw it is proper safety equipment. A chainsaw is a powerful machine and, if it’s not given the respect that it deserves, using it can easily result in serious injury. I don’t say this to scare anyone, just to emphasize the fact that we should never take shortcuts when it comes to safety. That’s why I thought it would be important to include some reviews on chainsaw safety helmets for the site as well. You don’t have to be any kind of expert in safety to protect yourself when it comes to using power equipment like chainsaws – you just have to exercise a little common sense. Using a safety helmet with a protective shield to defend yourself from flying debris created while sawing wood with a chainsaw is common sense. A standard hardhat by itself isn’t going to do the job and that’s why we recommend a safety helmet with a proper face guard specifically designed for chain saw use. The rest of this page is dedicated to looking at some of the best-rated chainsaw safety helmets on the market and their key advantages. You might be surprised to find out that choosing a chainsaw safety helmet is not necessarily a simple straightforward process. There are several key features you should be looking for when choosing a safety helmet, such as its safety rating, whether or not it comes with hearing protection, and, of course, whether it has a face guard of some kind. It’s also important to make sure that it actually fits your head – most helmets are adjustable, but it’s something you should be sure of before you purchase a helmet. The best picks we’ve chosen for this page all include these basic safety ingredients, and anyone of them are great choices. It’s probably not a surprise for anyone that’s familiar with the company, but Husqvarna is the one manufacturer to make this list twice. The second helmet on our review page is the Husqvarna 577764601. It has the same features as the standard Pro Forest helmet, but it also comes equipped with a couple of extra features that make it worth making our best safety helmet list on its own merits. A safety helmet is bound to receive a lot of direct sunlight over time and that can weaken the outer shell of your helmet and cause a fair bit of discoloration. The 577764601 has built-in UV protection that will extend the usable life of your chainsaw safety helmet by years. It’s an extra feature that you probably wouldn’t normally even consider when purchasing a helmet, but it’s an important one nonetheless. 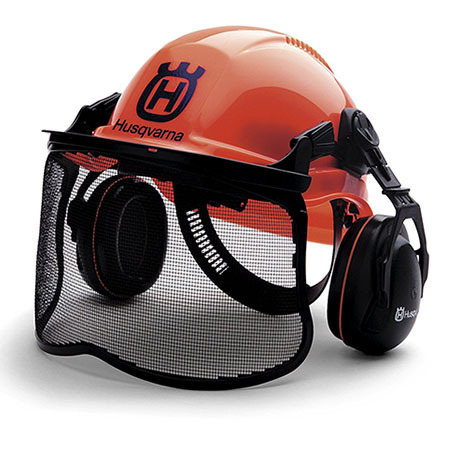 Different helmets have different materials that they use for face coverings; in the case of this Husqvarna safety helmet it’s equipped with a steel mesh face guard that will resist most flying debris. The great thing about a steel mesh faceguard instead of a plastic full-face mask is that it doesn’t have a tendency to fog up. You can go about your business without having to worry about having a cloth on hand nearby to keep your vision clear. 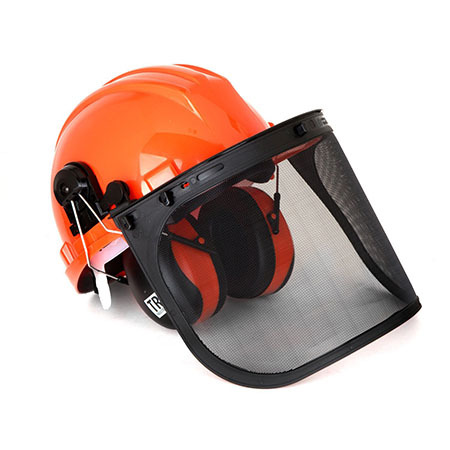 The TR industrial forestry safety helmet provides professional-quality safety for use both at work and at home. It comes with all the safety features you need to protect everything above your shoulders. Best of all it’s priced at well under $75, which makes it affordable for the average homeowner or forestry worker. This is a solid looking helmet, but they haven’t forgotten about comfort as it’s fully adjustable. If you’re looking for a reliable and sturdy helmet that will provide you with protection while you work, then the TR safety helmet is a great choice. You have two different choices of visors with this helmet – a mesh one and a plastic one. It’s up to you which one you prefer to use, but both have their obvious advantages. The mesh one won’t fog up on cold rainy days, but it does leave the small possibility of a splinter finding its way through the protection. The plastic visor ensures full face protection, but you do have to put up with the potential for fogging up from time to time. As anyone that’s ever used a chainsaw is well aware, they can create an incredible amount of noise. That’s why hearing protection is just as important as facial and head protection when working with a chainsaw. This helmet also comes with a set of earmuffs attached to provide you with the hearing protection you need. They are compliant with all safety standards and, if for some reason you do wish to remove them, they are designed to be removable as well. The Husqvarna name has been synonymous with quality for many years now and that definitely applies to their Pro Forest series of chainsaw safety helmets as well. These helmets feature all of the best features of a safety helmet and they’re built to last. Typically, you can expect to pay somewhere between $50 and $100 for one of their chainsaw safety helmets, which is right in line with the rest of the industry. If you want reliable protection a Husqvarna helmet stacks up well against the competition. The Husqvarna Pro Forest safety helmet is designed to fit just about anyone. It is fully adjustable so that you can set the size to fit your own head. It uses a ratchet system that’s quite intuitive so that you don’t have to mess around with each individual piece inside the helmet to find the right size for you. It’s quick and easy to adjust and just one more reason why this is a great choice as a chainsaw safety helmet. If you’re using your chainsaw in an industrial setting it’s important to protect yourself physically, but it’s also important to make yourself as visible as possible – to avoid other workers accidentally injuring you. 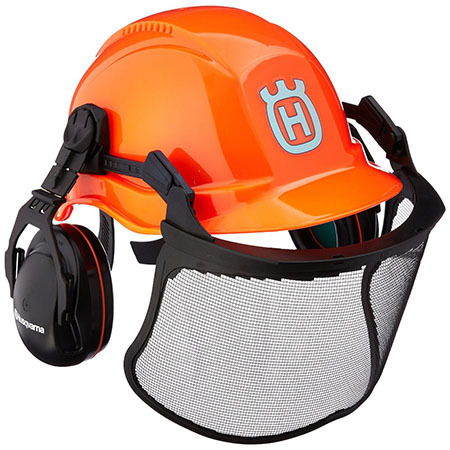 This safety helmet has been designed with a Hi-Viz Orange color that helps you stand out in the crowd. Other workers can easily see you and avoid any unsafe practices while you’re around. Of course, accidents can happen at times so you always have to be vigilant yourself as well. Stihl is one of the most powerful names in the work world and they offer a wider range of products that also happens to include chainsaw safety helmets. The Stihl Woodcutter Helmet system has all of the built-in safety features you’d expect including a full face shield and hearing protection. You can buy these items separately, but why would you when you can find it all together in one overall package? A chainsaw is a heavy piece of equipment; while that may be unavoidable, it doesn’t mean the rest of your equipment needs to follow suit. 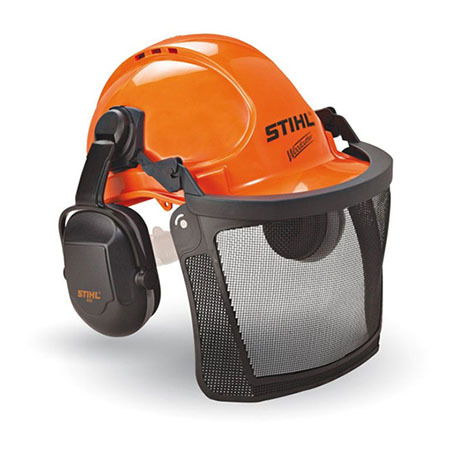 Another great feature of this Stihl helmet is that it’s lightweight. It still provides you with solid protection from flying debris and falling branches, but it does that without unnecessarily weighing you down. When you’re out in the back woods working hard sawing through log after log, you’re bound to work up a sweat. Having to wear a hard plastic helmet for protection may be necessary, but it can also be uncomfortable. The folks at Stihl have built a ventilation system into their woodcutting helmet that will minimize the effects of that greenhouse developing on top of your head. The end result is a more comfortable experience that will make you forget that you even have a helmet on your head. The Chainsaw Protective Safety Helmet by Stens is one of the more affordable options when it comes to head protection for working with a chainsaw. That doesn’t mean it won’t provide you with the type of protection you need. It meets and exceeds government safety standards and it’s equipped with all of the common safety features you’ll find on more expensive helmets. The last thing you want to do when operating a chainsaw is to forget about protecting your ears. When operating a machine such as a chainsaw that operates at higher decibel levels, there’s a very real risk of permanent hearing loss. 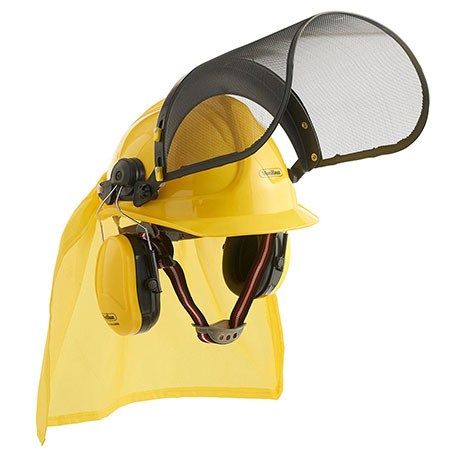 This Stens helmet is fitted with ANSI-compliant ear protectors that cover your ears completely. Surprisingly, this helmet is equipped with a ratchet adjustment feature that makes it easy to make alterations to the size so that it comfortably fits just about any size head. It doesn’t matter whether you’re 5’2” with a small head, or 6’4” with a massive cranium – this helmet can be adjusted to fit to order. It has its limits, but this safety hat will fit just about anybody. The VonHaus 4-in-1 safety helmet is just what it sounds like – a 4-in-1 safety system that provides you with the maximum protection possible when you’re sawing wood. It comes equipped with the hardhat, the visor, hearing protection, and a cape that will protect your neck in wet weather. All of this will cost you less than $50 – not a bad deal at all. Working all day while your helmet keeps sliding and slipping off your head can be more than just a little annoying. Fortunately, this VonHaus hardhat has a six-point adjustable headband that allows you to quickly and easily adjust it so that it fits your head snugly. That way you can go about your business of sawing wood and not have to worry about your hardhat potentially falling off. There are times when you may wish to take a look at some work you’re doing without having to take your hardhat off, but you can’t get a great view if you’re looking through a visor. With this problem in mind, the manufacturers of this hardhat have included a hinge on the visor that makes it easy to lift the visor whenever you need to. The last helmet on our list is the ERB 14371; it’s another safety helmet that comes with a complete safety kit. If you opt for this helmet you’ll get complete face protection, head protection, and hearing protection. It’s a comprehensive safety solution for homeowners and industrial workers alike. It’s also priced competitively at well under $75. 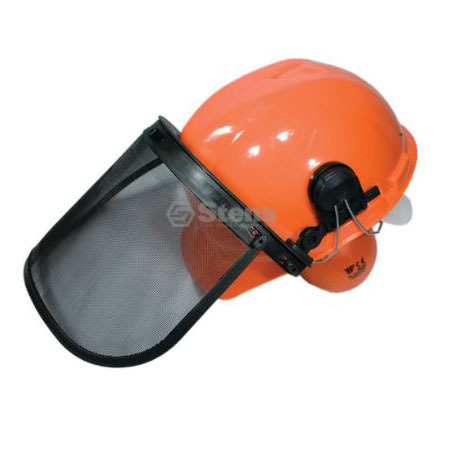 This is another great safety helmet that comes equipped with a steel mesh face mask. 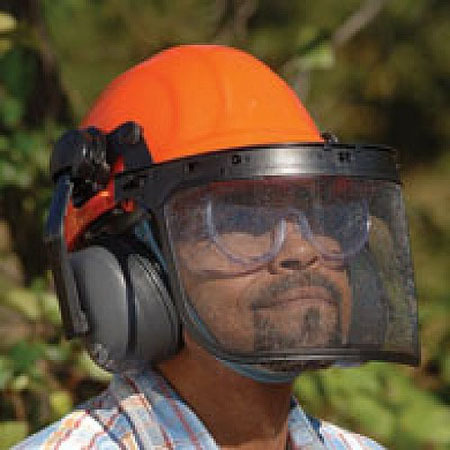 A friend of mine actually uses this particular helmet at work and he’s convinced that the steel mesh face guard on this safety hat saved his eyes when a piece of flying debris from some wood he was cutting impacted the mask with considerable force. You may not run into this type of issue often, but it only takes one time to cause serious injury; that’s why it’s important to have this type of protection all the time. Not content to leave the protection of your eyes to chance, the manufacturers off this ERB safety helmet also include a pair of anti-fog safety goggles that you can wear underneath the mask. This added bit of protection may seem like overkill, but when it comes to protecting your eyes there really isn’t any such thing. It’s better to have too much protection than not enough. Operating a chainsaw without a safety helmet and face guard is something you really shouldn’t consider. If you look for a helmet that has both face protection, head protection, and hearing protection you should be okay. Any one of the helmets on this list are great choices and there are probably others, but these are our favorites. The main thing is to make sure you have proper protection.